Abbas Khan, Najam Khan and Haider Farman stood victorious in their respective fights at the historical Brave 17 event at Lahore, Nishtar Park on Saturday. In the first fight of the first international MMA event of Pakistan, Abbas Khan faced off against Sikander Badar, where Khan dominated his opponent and stood victorious at the end of bout. In another fight, Najam Khan took on Afghanistan’s Mohammad Waseem, who could not take the Pakistani pugilist for long and just lost the fight in early minutes of the bout. It was a convincing win for the talented Pakistani mixed martial artist. In the third fight of the event, the rising MMA star of Pakistan, Haider Farman entered the octagon against Ariel Oliveros from Philippines. 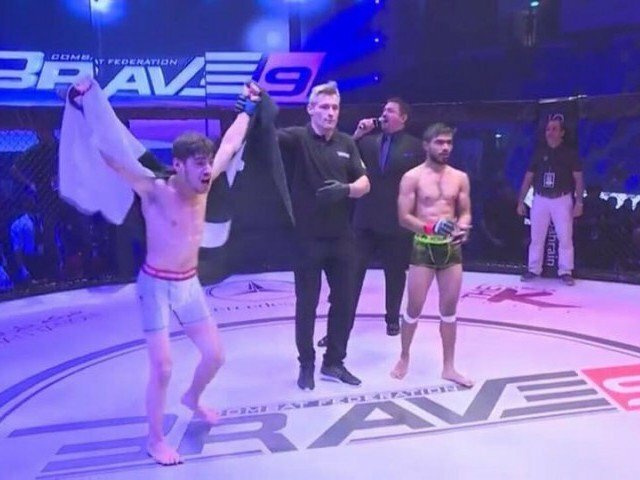 The Pakistani MMA star got the better of his Philippines’ opponent and raised his hand as the winner. Whereas, Pakistan’s famous MMA fighter Uloomi Karim Shaheen failed to win his bout against his Philippines’ opponent Jeremy Pacatiw. Shaheen gave his opponent fighter a tough time, but it did not prove enough for him to get the decision from judges in his favour. Pacatiw won the fight via unanimous decision. The Brave 17 event featured 10 fights, where 20 local and international mixed martial arts fighters fought for the gold. It was Pakistan’s first international and by far the biggest mixed martial arts event. The founder and CEO of ARY Digital Network, Mr Salman Iqbal signed a contract with three companies to bring the Brave Combat Foundation in Pakistan. Mr Salman Iqbal was also elected as the president of Brave 17. Moreover, ARY was the official media partner of the event.